The rise of the ‘expectation economy’ has put traditional recruitment in its place. What was once a process based on transactions is now an experience built on authenticity. As recruitment marketing continues to take aim at the consumer approach, the omni-channel continues to reign. Talent leaders are asking themselves: "How do I reach the right candidates, whenever and wherever they are?" Talent Acquisition is no longer a short game -- it's a strategic game that requires a cohesive, integrated solution. 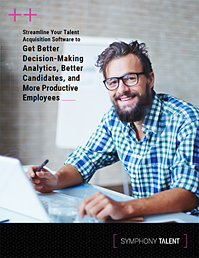 In our latest eBook, Streamline Your Talent Acquisition Software to Get Better Decision-Making Analytics, Better Candidates, and More Productive Employees, you will learn how your company can benefit from having a streamlined approach to hiring top talent. Why to beware of the “Franken-system”—disparate technologies sewn together with the hope that everything will play nicely together. The reason why separate point solutions will give you headache after headache. How an end-to-end solution can solve these issues. Yes, I'd Like A Copy! Stay up-to-date. Sign up for our latest news.